All right my foodie friends, I can hear you sniffing at me right now. Chex Mix? Really? Well suckas, Chex Mix happens to be a) delicious, and b) filled with gluten. So put away your organic wine from the Willamette Valley and pay attention. ‘Cuz we made some gluten-free Chex Mix to help ring in the holidays and . 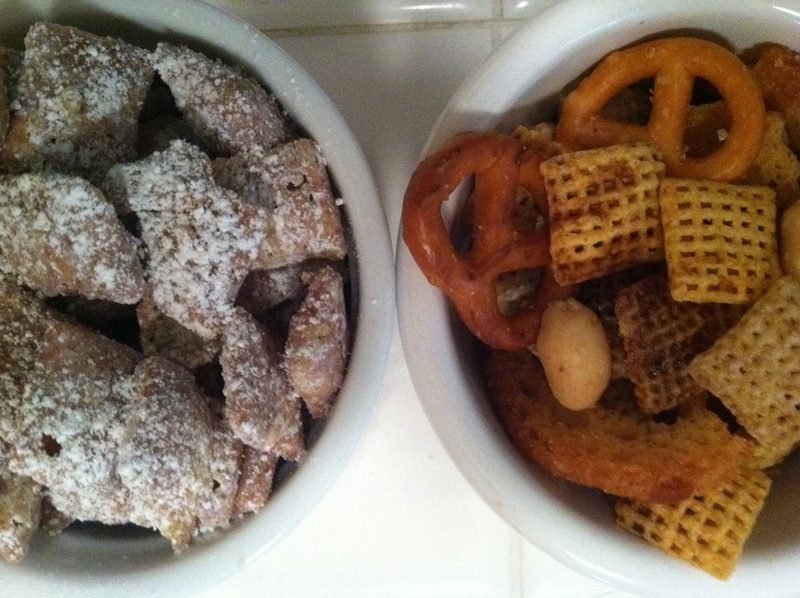 . . gluten-free Muddy Buddies. Oh yeah! That’s how we snack. Since I didn’t want to sully my rep as an amazing chefs-tress (ahem), I decided to employ my family in the making of the holiday Chex snacks. 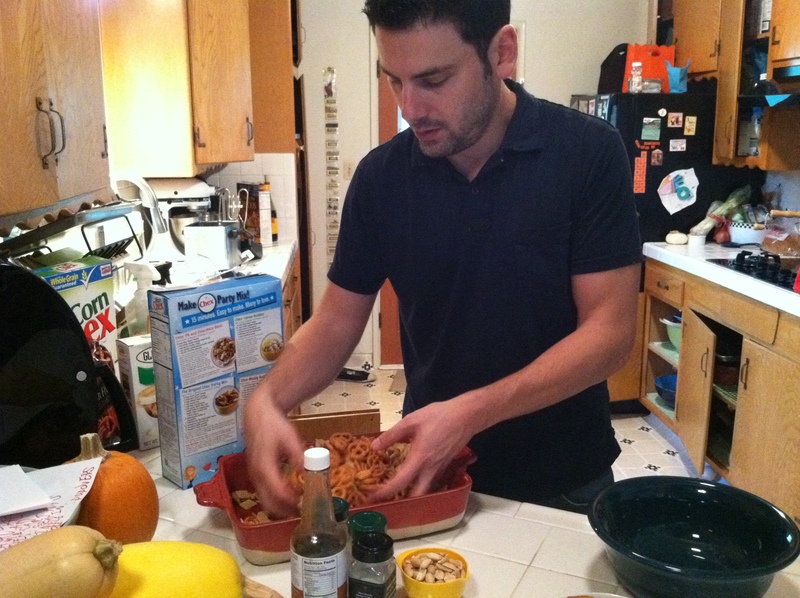 First up, my husband who insists on having Chex Mix starting November 23rd and running all the way into the new year. Look at my man go! This is also where I enlighten you with our enlightened-ness: We’re a mixed religious family. And while I may connect Muddy Buddies with Thanksgiving and Christmas, clearly the Jewish half has other ideas. I mean, Sukkot has been over for like 41 days. Really. 1. Heat oven to 250°F. In large bowl, mix cereals, nuts, pretzels and bagel chips; set aside. In ungreased large roasting pan, melt butter in oven. 2. Stir in seasonings. Gradually stir in cereal mixture until evenly coated. Bake 1 hour, stirring every 15 minutes. 3. Spread on paper towels to cool, about 15 minutes. Store in airtight container. Tags: gluten free christmas, gluten free holidays, gluten free junk food, gluten free recipes, gluten-free thanksgiving. Bookmark the permalink. I actually made this a couple of weeks ago and it tasted the same as regular Chex Mix to me! Plus, I’ve never liked wheat Chex anyway bleh! That’s right, screw that wheat chex! Btw, what brand of gluten free pretzels do you use/prefer? I bought the Glutino ones when I first went g-free and while I think Glutino makes a lot of g-free stuff that tastes pretty good…the pretzels…not exactly the best, lol. For this Chex Mix I looked for a different brand and found these Ener-G Wylde Pretzels (they’re circle-shaped) that I think taste waaaaay more like regular pretzels. I bought them at Sprouts Farmers Market (formerly called Henry’s I think) in case you have one in LA somewhere, the one I go to is in Corona. You know, I really love the Glutino pretzels because they taste so buttery. When did you last try them? I just went g-free this year so I wonder if they changed the recipe? Or if I just love butter so much I don’t notice. But I’m going to check out the Ener-G. I’m guessing they’re also dairy-free? I do believe they are, and I just started trying them within the past few months. Also, I saw on (I think) glutenfree.com…or some online store where you can buy gluten free food that Snyder’s makes a gluten free pretzel which I hope would be delish! Have yet to see it in the store though. Worchester sauce includes barley in it so if you are true celiac this recipe is not totally gf! There is Worcestershire that is gluten-free. I made muddy buddies 2 weeks ago! I forgot how good they are. My gluten -loving sister ate handfuls. Muddy Buddies rule. That is all. I can buy gluten free cereal, but I would really like to make my own mix. So far I have crushed nuts, raisins, dried fruit and coconut in mind. Any ideas?. Mix and drop onto parchment paper…smash down and bake at 350 for 8-10 min. Can I say OUTSTANDING?!?! And here I am with a brand new jar of peanut butter. That does sound unbelievably RAD. Thanks Kelly! Speaking of great PB Cookies, you can also add a cup of chocolate chips to that sugar-egg-peanut butter mixture. Yum! Just a small heads up, worshteshire sauce contains gluten! Unless you’ve found a gluten free alternative. If so, I’d love to know where, because I used to love the stuff in everything! Yep, my worchestershire (sp?) sauce is gluten-free. I buy it at Whole Foods, and it’s clearly marked. It is Annie’s naturals, but even Lea & Perrins says it’s gluten-free. Kraft’s Worcestershire Sauce is gluten free, too. I just made both today as well. By the way, April, if you’re one of those people who can handle oats, Van’s company (of the GF frozen waffles) has started making a Say Cheese! oat-based cracker that I put into my chex mix rather than the bagel chips (which I have to be in the mood for). I need to try those! I’m unclear about how I am with oats because I eat only small amounts with no problems. Love GF Chex mix. Snyders does make GF pretzels that are also Dairy, Egg, and Casein free, and they taste like normals. I just completed my second batch of GF White Trash–with the GF pretzels, honey-nut GF Chex, rice crispies, pecans, cashews, and Craisins, covered in Almond Bark vanilla chocolate. The first batch lasted 1 day and it makes a HUGE batch. Melt the Almond bark in a double boiler and pour over all of the dry ingredents. Mix well, drop onto waxed paper to cool and munch away! Because store-bought Chex mix has gluten in it. You have to check your worch sauce to make sure it’s gf, you can’t have the bagel chips that come in the pre-packaged, and so on. Thanks we are going camping this weekend with the cub scouts. My son probably won’t be able to eat the food. We will have to take our own just in case. My cooking skills are AWFUL. During Lent we eat fish so we will be ok Friday. I am planning to take some P&J, vienne sausages, I think plain yogurt is out of the ?. I really wanted to take chex mix so during each stations if he gets hungry he could have a snack. Fruity Pebbles has a snack. I am also looking for a gluten free recipe book. Please email me if you or anyone else have any ideas. My address is sewintime40@yahoo.com. Thank you in advanced!!! Was just wondering if you knew that Worcestershire sauce contains gluten unless they have changed that very recently Or if you have found a gf brand. Just don’t want anyone getting Sick. Both Annie’s and Lea & Perrins are gf! Every time one of my friends calls it “puppy chow” I gag a little. It’s definitely a regional thing! Thank you! I think that name is disgusting. I always knew this recipe as “muddy buddies” and refuse to call it anything else. I agree. I don’t like to think about sitting around and eating dog food. Thanks for posting this. Looks awesome, totally going to make it but the old Worcestershire has gluten in it. There are some gluten free varieties out there that will have to do. Yes, some are most def gluten-free. Which is very exciting. Good luck!